Although there are a number of 3DS games I'm looking forward to getting my grubby hands on next year--the next Animal Crossing, Etrian Odyssey IV and Fire Emblem: Awakening, among them--I'm eagerly awaiting quite a few 2012 releases, too. Sitting atop the latter list: The latest (and hopefully greatest) chapter in Nintendo's Paper Mario saga. The game will sport a slightly different name--Paper Mario: Super Seal--when it hits the streets in Japan on Dec. 6, and naturally it'll sport a different piece of box art, too. Although I'd love to show you the cover art that'll be used on the Euro version of this Intelligent Systems-developed game, which also will be called Paper Mario: Sticker Star and will arrive on store shelves on Dec. 7, Nintendo of Europe has yet to reveal it. Given that, I guess we'll just have to judge the pair of illustrations showcased above. Personally, I much prefer the North American cover art to its Japanese counterpart this time around. Granted, the latter option does a much better job of depicting the game's sticker-collecting aspect, but that isn't enough to trump the former's bold use of color. Now that I've had my say, what do all of you think of the box art that's been prepared for this portable RPG? Hmm kinda weird that there's no Euro version yet. The US one tho has a more "action" feel to it. The Japanese one just shows that its about stickers and Mario. Will be interesting to see if the Euro version will be any different or if it will adopt either of these designs. I'm with you, Bryan. I think the US version is better by a landslide. Igor: Yeah, it's especially weird that the Euro box art isn't out yet considering the game will be released soon. Hmmm. I agree with your assessment of the two options, by the way. I actually like both, but I prefer the colors and 'feel' of the NA art. The JP art is kind of boring in comparison (IMO). Thanks, Adam! Yeah, I wouldn't say either piece of art is terrible. Also, I do think the JP art is a bit better designed. I personally went with the NA art, though, because of its *energy*. By a landslide, eh? That surprises me, Justin! How are feeling about this game, by the way? Are you still a bit skeptical of it? I know you were earlier. I still look at it sideways. I don't trust it entirely, as it's sort of pretending NOT to be a card-based battler. But in essence, stickers = cards, and you need stickers to do battle. Hence card based battler. I don't LOVE things like that, because I'm a hoarder of items. But...eh...I'm excited to play it anyway. It's Paper Mario, and I've always loved the humor in it enough to look over flaws. Ah, that's interesting, Justin. I honestly don't think I've played enough card-based battlers to know if I like or dislike them. I guess I'll find out with this game! This one is easy for me, the Japanese version. First of all I just kind of think that yellowy gold color is pretty ugly, but other than that I just hate America's determination to make every game cover action-orientated. The Japanese cover says "Adventure!" the American cover says "LOL IN THIS GAME YOU HIT THINGS". Hey there, Trxd! You think the yellow is ugly? Huh. That's my favorite part of it, to tell you the truth. Other than that, I agree with you that it's rather annoying -- and humorous, I had to add -- that NOA's designers nearly without exception seem to be obsessed with making box art that features angry characters or violent-ish scenes. It's as if we Americans hate cute or nice things. Sigh. Well, hm... This is a tough decision for me! 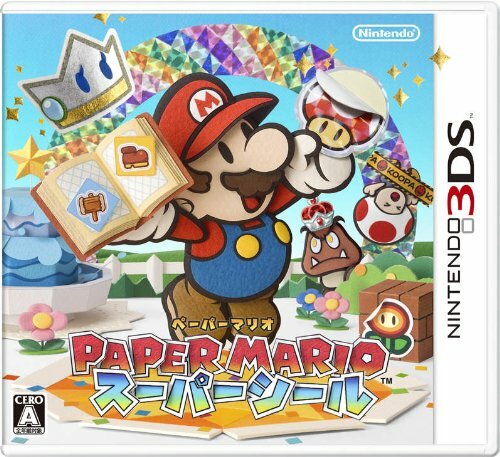 Though I love how the stickers are portrayed on the Japanese cover (as you said, they actually illustrate the sticker-collecting aspect of the game) and the yellow-eyed "king" Goomba just behind Mario, I do like the US's use of yellow and the crooked placement of the logo. So I'm going to have to go with US! I wonder if the JP boxart has an actual sticker on it. Probably not. But I wonder if the JP boxart also has a real foil portion for that foil sticker behind Mario. I dunno'. Hello Anne! You know what? I didn't know that stickers are called seals in Japan until just now! Thanks for letting me know, especially since I was wondering why Nintendo went with seal rather than sticker. Welcome back, SUIKA! Ah, I doubt the JP box art has an actual sticker on it, although that would be pretty cool, if you ask me :) It having real foil on it is more likely, I guess. Regardless, it's a pretty nice piece of art if you ask me. I've preordered this game months ago and I'm looking forward to the release but I'm not sure if it will be as much fun as the N64 or the Gamcube-version was. I was kinda disappoimted of the Wii-version and I hope the new one gets back to its roots. I think I like the NA-boxart more because of the picture-constellation. Hello again, Melody! Yes, it'll be interesting to see if this version is as fun as the N64 or GC versions. I do think it'll be more fun than Super Paper Mario, though, so at least there's that. Regardless, I'm really looking forward to it. Oh, and I agree with both of your comments regarding this game's NA and JP box art! From a design perspective the NA one wins hands down--if I squint at them, the NA version retains some visual interest and pop (the color really helps) and the Japanese one blurs into nonsense. But I like the setting and mellow sense of the Japanese version better, and I feel a kind of bias against such an obvious (as mentioned by others) "angry action" kind of treatment, I feel like I can almost read the formula that generated it! Neither reflects the weird fun adventures that draw me to Paper Mario (I should play Thousand Year Door again sometime), so I don't actually consider either of them very successful. Thanks for sharing your thoughts, gsilverfish! I think you've helped me figure out why I don't quite like the Japanese cover art: It's just too mellow! Like you said, it would be nice if both illustrations were a bit wackier, in my opinion. 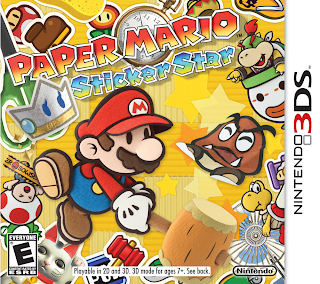 This is a Paper Mario game we're talking about, after all! I did notice both emphasize (sort of?) that crown thingie, which I assume is your "Navi" for the game, so there is a bit of the story sticking out there, but it's hard not to just think of it as some weird crown thingie, like, "why is it even there?"